When you arrive at Rundle’s Mission you will notice the large grassy hills surrounded by an expansive forest of flora and fauna. 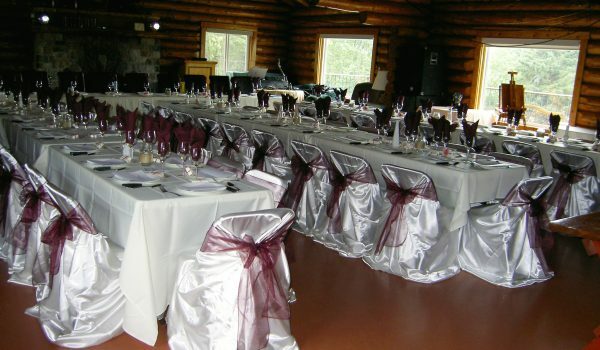 The Memorial Lodge is situated on a hill overlooking Pigeon Lake with a view of the entire area. 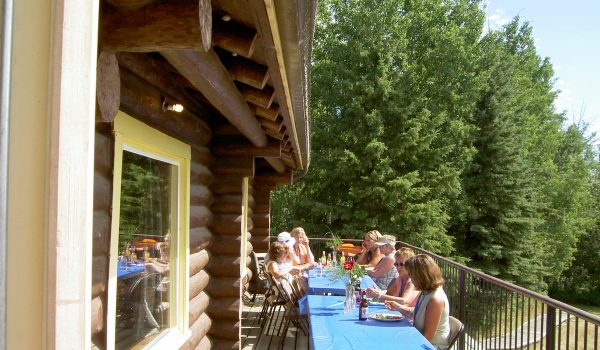 The two level hand-hewn log lodge perfect for gatherings of up to 100 people. There are two bedrooms with bunk beds for up to 24 guests. (If you require more sleeping we also have two cottages on site for 22 guests.) The lower level features the dining area with fully stocked catering kitchen with BBQ, wood fireplace, 8 beds and the bathrooms. The upper level has a beautiful sunny common room with fireplace, deck overlooking the lake and a bedroom with 16 bunk beds. 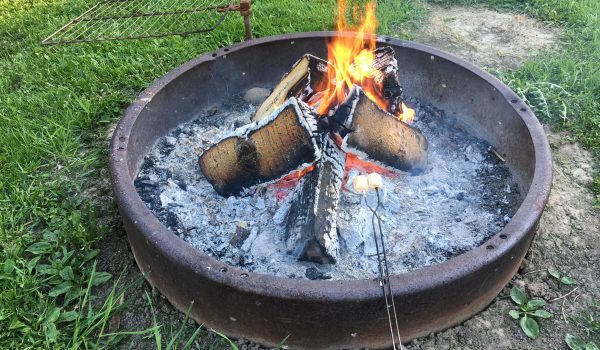 You can enjoy the fire-pit outside the lodge and there is lots of green space for games and activities. Central Heating and open year- round. Some RV parking available as well as tenting. Internet requires a password. Check In Time is 4pm and Check out at 1pm. Pets are welcome but must be on a leash and are not allowed in the facilities. 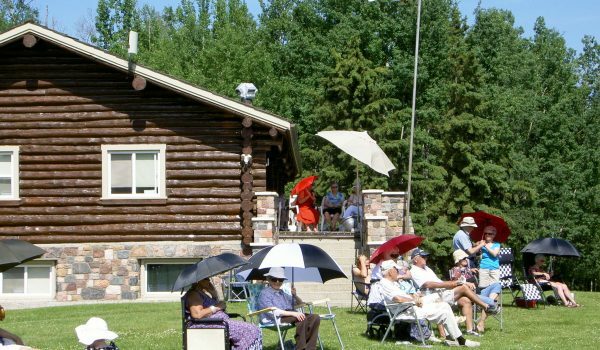 Rundle’s Mission features a Lakeshore Lookout Gazebo, large grassy lawns for games and groomed cross country skiing and hiking. It really is a nature lovers paradise! The area is perfect for biking, flying a kite or playing golf at one of 4 local courses. There is a towne center within 15 minutes with stores and restaurants. 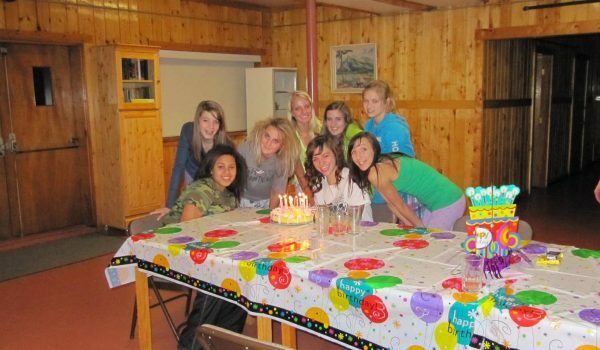 We love to host seminars, weddings, family reunions and and church camps. Special rates for CRA registered charities! Built in 1957 by master craftsman Hobart Dowler, the Memorial Lodge beckons a time of creativity and pride in workmanship. 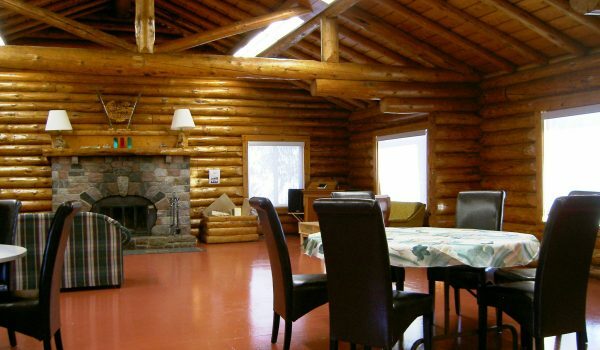 The two-story lodge overlooks Pigeon Lake and features two stone fireplaces-one on the lower level dining area and one on the upper level common room. The deck is along the south side of the building with a beautiful view of the lake and countryside. 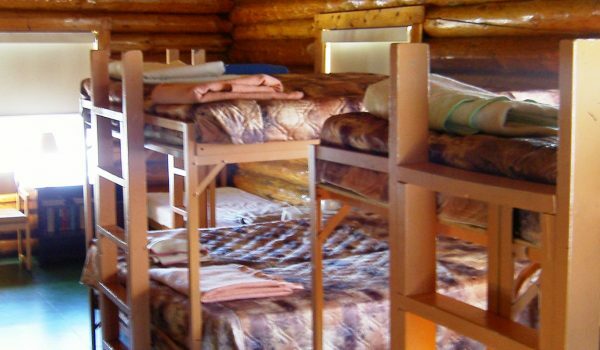 The dormitory style sleeping bunks (8 beds lower level and 16 beds upper) are perfect for family reunions, youth groups and ladies getaways. 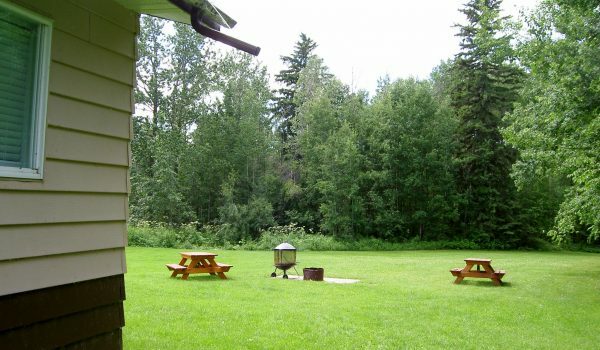 When renting the Lodge you have access to all amenities including the fully stocked catering kitchen with dishware for 60 guests, a BBQ, outside fire-pit, piano, internet (you must request a password), karaoke and PA system and large grassy areas for games. There are also chairs and tables for 100 guests. 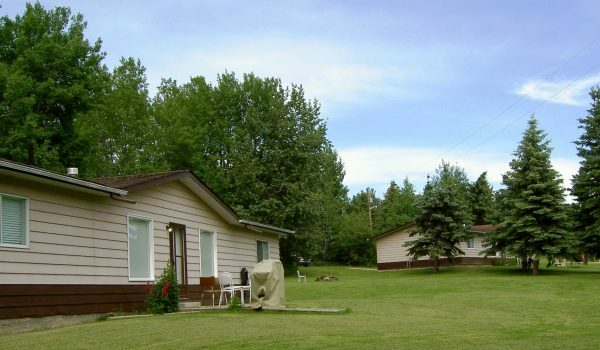 Additional services include wood, linen, RV sites and tenting. Overlooking Monument form Lodge Deck. 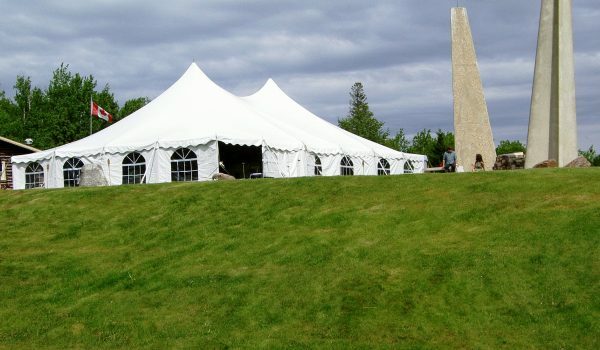 A wedding tent can be installed on the lawn area. Enjoy a luncheon on the deck. Upstairs wedding for 60 people. 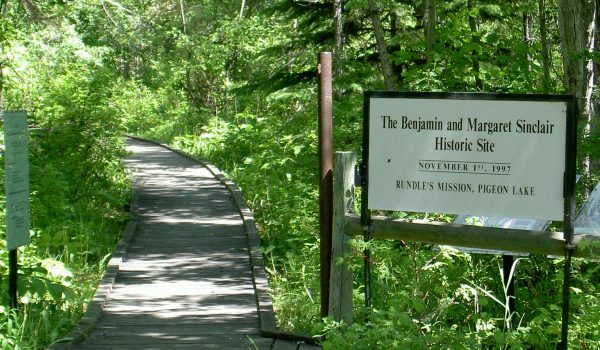 Historic Boardwalk tells about the history of the missionaries, fur traders and Indigenous Peoples. Historic Monument is a perfect spot for weddings or church service. 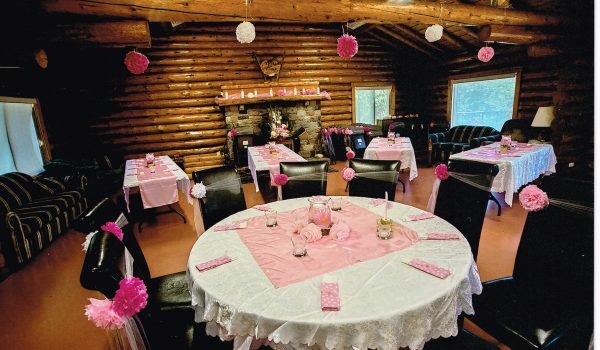 Lodge Lower Level -great for birthday parties. 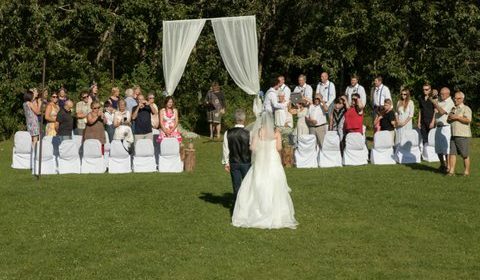 Small weddings in a beautiful setting. The Country Cottage has five bedrooms with a full bath in each room. 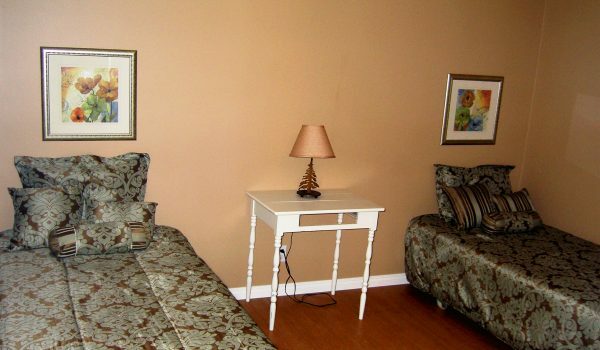 There are three rooms with two twin beds, one room with a double bed and one room with three twin beds. 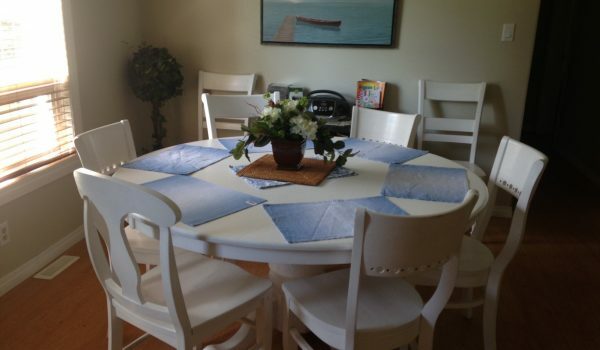 Each house has one room that is handicapped accessible with a wheelchair shower. The center of the house features a dining room and living room with large picture windows for plenty of natural light. 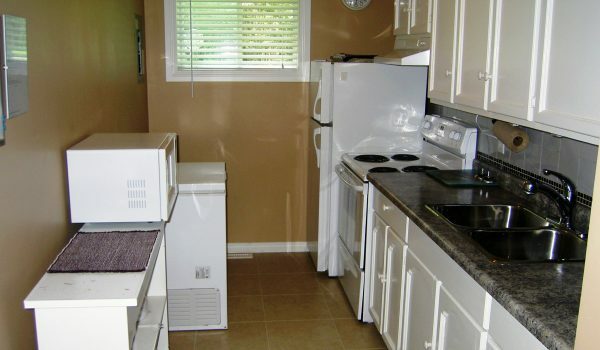 The kitchen is fully equipped for 15 people with fridge, range, microwave, coffee maker and chest freezer. All cooking utensils and dishes are supplied including a gas BBQ. Optional services are linen, wood, and RV/tenting sites. 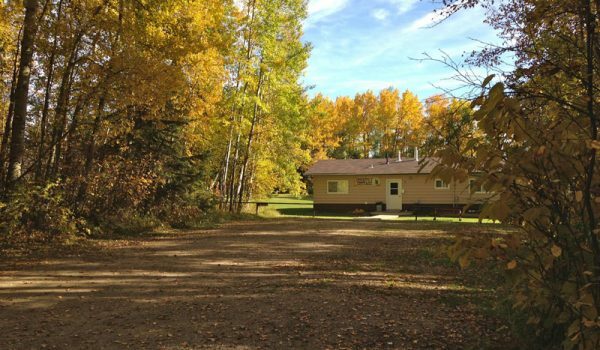 Each house has its own fire-pit to enjoy a wiener roast and campfire songs while star gazing into the night sky. Behind the guest houses is the entrance to 220 acres of Nature Conservancy. You will discover 6 km of nature path and groomed cross country ski trails in the winter months. 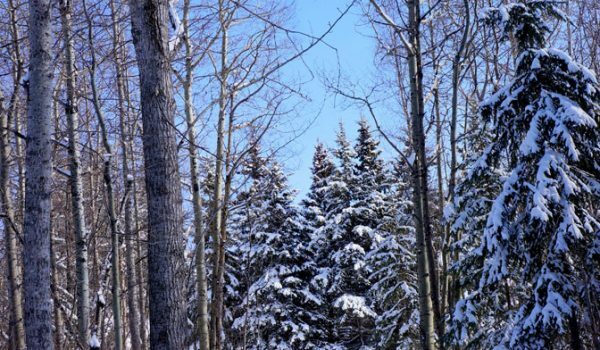 It makes a perfect spot for enjoying the natural environment and you might even see a moose or deer who live in the woods year-round. 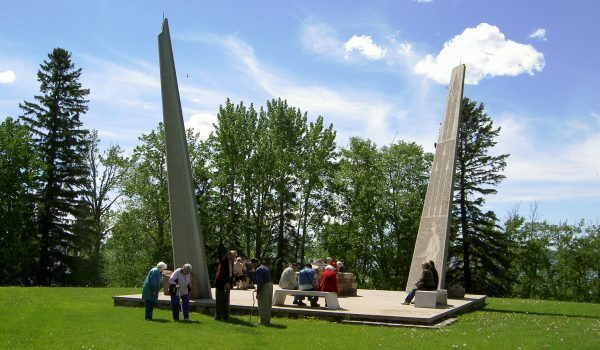 Beside the Memorial Lodge is an Alberta Historic Site with Interpretive panels depicting the history of this site and its importance to the settlement of Western Canada. There are 6 km of hiking paths and groomed XC ski trails right out the back door. Lots of grassy areas to throw a football or slide down the hills on your tobaggan in the winter. There are 4 golf courses and two town centres within 15 minutes. Mission beach is a 10 minute walk to a roped off beach area with a playground. We are on the lake but our beachfront is not suitable for children. We feature a beautiful Lakeshore Gazebo for a picnic at the lake or bird watching. It makes a beautiful spot for photos. 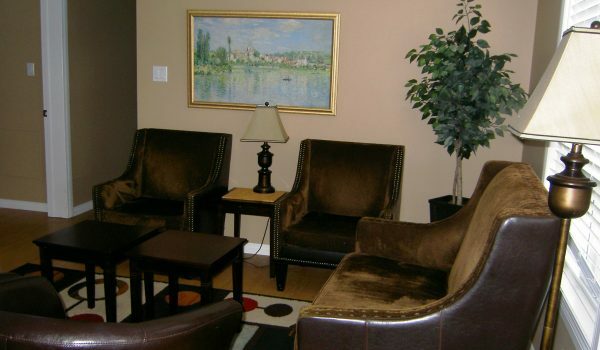 There is WiFi hot spot at the memorial lodge but we encourage you to unplug from your devices and relax! Rundle’s Mission is truly beautiful and unique. 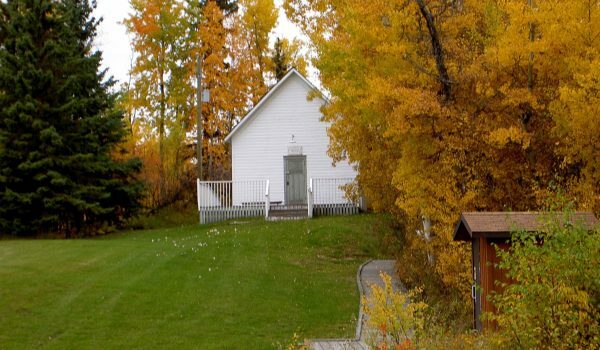 You can stay and play at an Alberta Historic site where fur traders and missionaries met with the indigenous Cree and Stoney people. 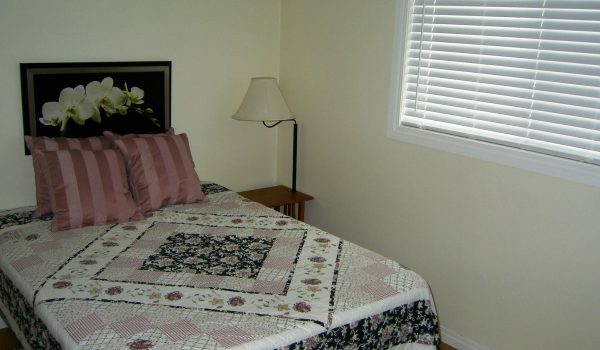 Country Cottage Accessible Twin Room. Country Cottage Twin Room NE. Discover our groomed ski trails right outside your door. Country Cottage Stroll behind the houses. 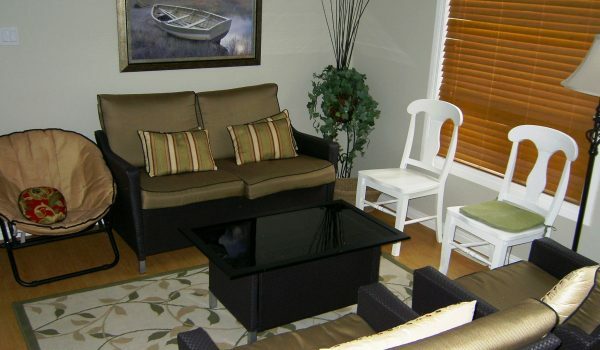 The Beach House has five bedrooms with a full bath in each room. 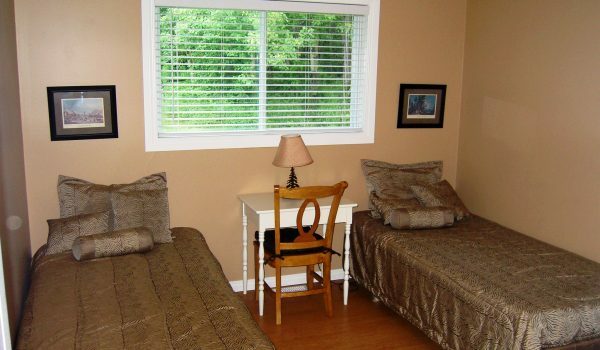 There are three rooms with two twin beds, one room with a double bed and one room with three twin beds. 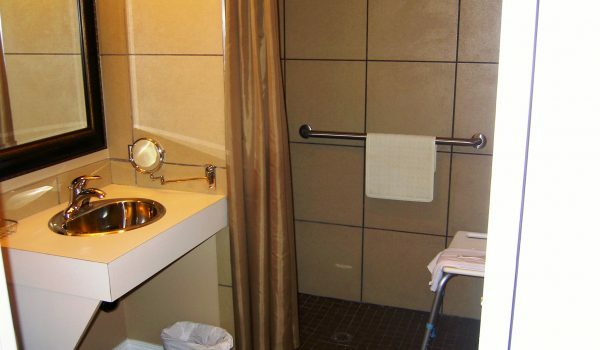 Each house has one room that is handicapped accessible with a wheelchair shower. 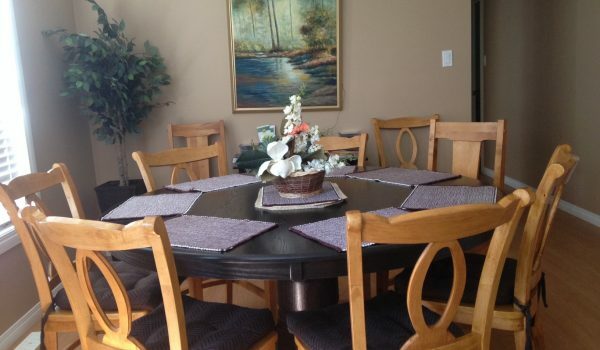 The center of the house features a dining room and living room with large picture windows for plenty of natural light. 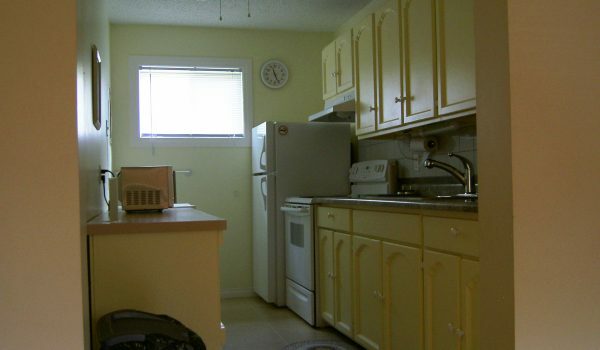 The kitchen is fully equipped for 11 people with fridge, range, microwave, coffee maker and chest freezer. All cooking utensils and dishes are supplied including a gas BBQ. 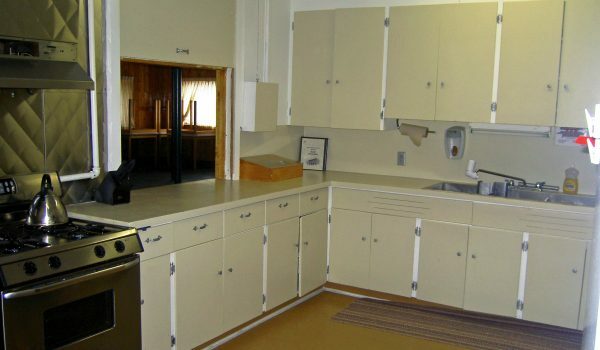 Optional services are linen, wood, and RV/tenting sites. 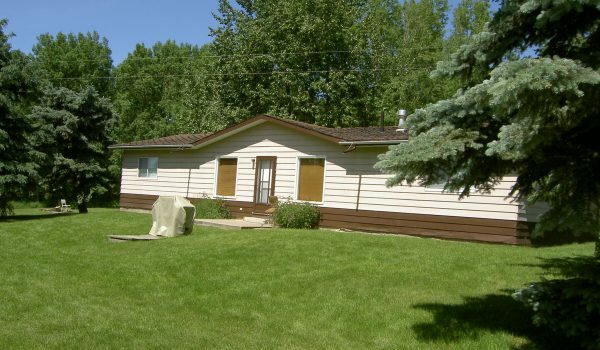 Each house has its own fire-pit to enjoy a wiener roast and campfire songs while star gazing into the night sky. Behind the guest houses is the entrance to 220 acres of Nature Conservancy. You will discover 6 km of nature path and groomed cross country ski trails in the winter months. It makes a perfect spot for enjoying the natural environment and you might even see a moose or deer who live in the woods year round. 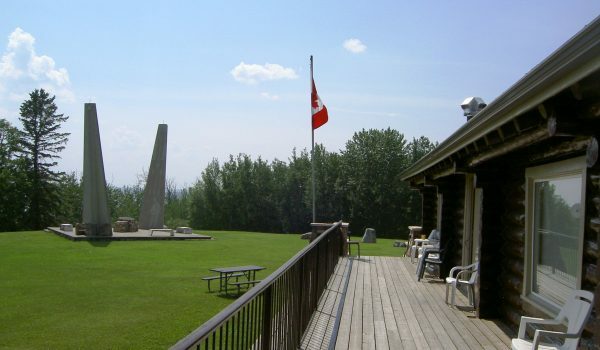 Beside the Memorial Lodge is an Alberta Historic Site with Interpretive panels depicting the history of this site and its importance to the settlement of Western Canada. Please Note: Part of the rental requires your group to leave the facility neat and tidy after your rental. This assists us in keeping our rates very reasonable.